Atsushi Fujimoto, Yukiko Hori, Yuji Nagai, Erika Kikuchi, Kei Oyama, et al. The motivation to act is influenced by the magnitude of expected rewards (incentive) and by one's current needs (internal drive). The basal ganglia have a central role in using information about incentive and drive to motivate action. Neural activity in the ventral striatum, including portions of caudate nucleus, and in the ventral pallidum (VP), a relatively little-studied output region of the basal ganglia, is correlated with reward size, and inhibiting neurons in these areas disrupts the relationship between reward size and task performance. How information about incentive and drive is combined and used to motivate behavior remains unclear, however. To address these questions, Fujimoto et al. recorded neurons in the rostromedial part of the caudate nucleus (rmCD) and in the VP as monkeys performed a task that required release of a lever to receive a reward. Four sizes of rewards were offered, and the size of the upcoming reward was indicated by a visual cue. The monkeys' responses were quicker and more accurate when the cue indicated bigger rewards; but error rates increased as the task progressed, rewards accumulated, and monkeys became sated. Thus, performance appeared to be influenced by both incentive and drive. Spiking in most neurons in rmCD and VP varied linearly with the predicted reward size, but such incentive-encoding neurons were more prevalent, and the effect size was greater, in VP than in rmCD. Moreover, spike rate changed sooner after cue presentation in VP than in rmCD. Both areas also contained neurons whose spike rates decreased across trials; similar proportions of neurons showed such drive-related responses in rmCD and VP. Importantly, reward size and satiation appeared to be encoded by separate, albeit partially overlapping populations of neurons. These results suggest that output from the VP modulates goal-directed actions in accordance with internal drives and the incentive value of rewards. Consistent with this, Fujimoto et al. found that inhibiting activity in VP increased error rates. The fact that reward-related responses appeared earlier in VP than in rmCD indicates that VP neurons must receive information about reward size from a different source. Future work should identify this source and determine where incentive and drive values are combined to motivate behavior. Oleksii Shandra, Alexander R. Winemiller, Benjamin P. Heithoff, Carmen Munoz-Ballester, Kijana K. George, et al. 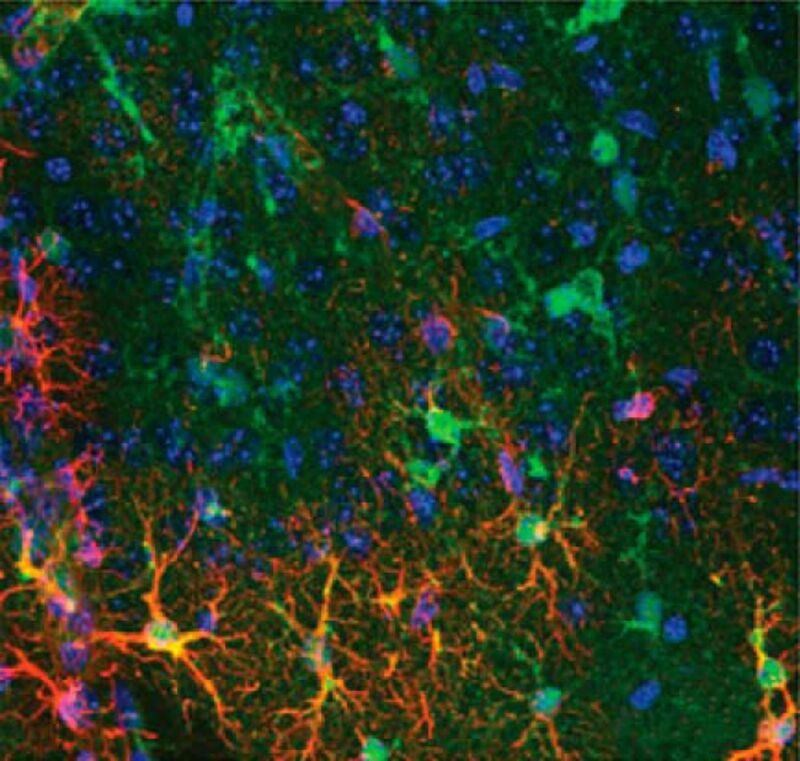 Astrocytes serve multiple functions in healthy brains, including taking up synaptic glutamate, buffering extracellular ions, and maintaining the blood–brain barrier. In addition, astrocytes react to injury and disease by releasing molecules that regulate inflammation and forming glia scars to limit the spread of damage. But these activities can produce detrimental, as well as beneficial effects: prolonged inflammation exacerbates neuronal damage and glial scars can inhibit regeneration. Furthermore, reactive astrocytes appear to contribute to the development of epilepsy after severe traumatic brain injury (TBI). GFAP (red) is upregulated in scattered astrocytes (green) in the cortex of mice subjected to repeated TBI. Blue is DAPI stain. See Shandra, Winemiller, et al. for details. Understanding how astrocytes change after injury might reveal ways to reduce the negative effects of reactive astrocytes. Importantly, however, astrocytes are phenotypically heterogeneous, even in healthy brains, and how they respond to injury depends on the type and severity of injury. Therefore, astrocytic responses must be investigated in a variety of injury and disease models. Many studies have examined the effects of severe TBI on astrocytes. In these models, impacts produce large focal lesions that become surrounded by an astrocytic scar. But most TBIs in humans are relatively mild: diffuse injury results from distortion of cells, but the skull remains intact and lesions are small or absent. Shandra, Winemiller, et al. created a mouse model of this type of injury and asked how multiple, relatively mild impacts affected astrocytes. As expected, expression of glial fibrillary acidic protein (GFAP)—a marker of reactive astrocytes—increased in cells dispersed throughout cortical gray matter after mild TBI. Surprisingly, however, patches of astrocytes had reduced levels of GFAP, as well as several other astrocytic proteins, including a glutamate transporter, a potassium channel, glutamine synthetase, and a gap-junction protein. Importantly, these atypical astrocytes were not associated with astrocyte or neuron death. Despite the lack of scarring or tissue loss, repeated TBI led to the development of spontaneous seizures 3–4 weeks after injury. This suggests that loss of normal astrocytic function, rather than cell death or glial scar formation, promotes the development of seizures after TBI. Future work should further characterize astrocytes in this model and determine which factors promote seizures and other negative consequences of repeated, mild TBI.